The sisters say they are focusing on finishing their next record. Haim posted a note on Twitter today (seen above) about their decision to cancel upcoming European tour and festival dates. The cancellations come about because the band is at a pivotal point in finishing up their heavily anticipated sophomore album. 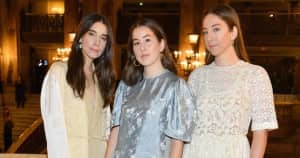 For those missing out on Summer Haim fun, the sisters do say they will make it up to all those who were anticipating the shows. A rep for Haim was not immediately available for comment.